A great success! The Captain, Richard Linsell, hosted a fun Casino Night on Saturday 19th March where members and guests pitted their luck against each other in horse racing, roulette and blackjack using 'monopoly money' to win a bottle of champagne for the highest winner on the night. Whilst experienced croupiers ran the roulette and blackjack tables it was the club's own members, Mark Rogers and Paul Lucas who capably managed the horse racing tote where large queues formed ahead of each of the eight races. Great fun and a fitting end to the social calendar for Richard's year of captaincy which officially ends on Saturday April 9th. Report by Alison Holland, Lady Captain: A big thank you to all who participated in this event. We had 46 players of all ages sign up for this competition. The sun shone and the wind was light, we had the best day of the Easter weekend. The format of playing in a team with a Junior, Lady, Gent and Vet was great fun. Hot cross buns before play and ham or sausage, egg and chips after seemed to be popular. As usual the team battle for the Ted Croft Trophy was closely fought between the Vets and the Gents with the Vets retaining their title. A valiant effort by the Juniors to come 3rd and unfortunately Ladies came 4th. It’s the taking part that counts. Prizes of Easter eggs and chocolate bunnies were given out to the best team of 4 and individuals in each generation. Also a special prize was given to Olivia McTigue who scored an amazing 47pts. Well played Olivia. Once again many thanks for all your support. It’s great to see all the sections of the club joining together and a mix of all ages and abilities. Best Individuals - Tim Gilbert (mens-36pts), Barbara Wareham (ladies-32pts), Barry Goodchild (vets-39pts), Louie Growns (juniors-37pts). 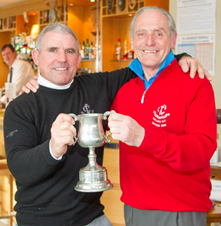 The annual match between Captain and Vice Captain, that was incepted by past-Captains Neil Fitch and Roy Fordham in 1997, was played over the Links at Hayling yesterday. Twenty-seven pairs took part in the four-ball, better-ball match and which ended with both sides all-square. The Captain, Richard Linsell, presented a bottle of wine each to the best winning pair of Sam Fraser and John Berry who trounced Richard Gale and Darren Edwards by 8&6. A special prize went to Ben Johnson who single-handedly defeated Mark Harvey and Peter Rowsell by 7 holes!! CLICK HERE to download the match report and photos from the day.